Greensville County’s Jacqueline Hill , No. 4, beats Surry County’s Amanda Jones, No. 2, to the basket as Greensville’s Jazlyn Jefferson and Surry’s Maya Drew trail the play Wednesday in Emporia. Greensville County coach Sharon Randolph knew her squad would have to click on all cylinders to knock off league-leading Surry County and move into a tie for first place in the Tri-Rivers District. In the end the Lady Cougars had a little too much for Greensville and all but wrapped up the Tri-Rivers District crown with a 53-42 victory. Greensville came close to playing perfect basketball early, but horrendous first-half free throw shooting, 4-17, left the Eagles trailing 25-17 at the half. The Surry (15-2, 13-0) defensive pressure also played a big part in stifling the Greensville (14-3, 11-2) offense. 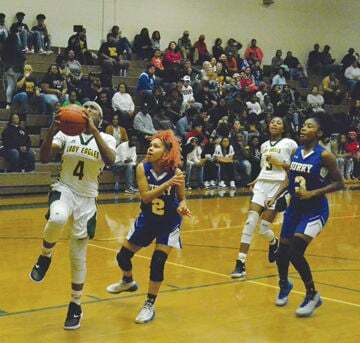 Leah Clements and Sanijah Robinson were held to a combined nine first-half points, while Surry’s Brecha Byrd and JeRhonda King netted a combined 21 points. The Lady Eagles chopped a 12-point deficit to 40-33 following a Clements 3-pointer with 7:42 left in the game, but the Lady Cougars balance and depth proved to be a little too much for Greensville to overcome as the seven-point margin doubled in the next three minutes. Alexis Nelson triggered the seven-point Surry run with a basket, followed by a Jasmine Pierce deuce and old school three-point play by Byrd to extend the lead to 47-33 with 4:36 left to play. The Lady Eagles never pulled within single-digits the rest of the way. Surry’s Byrd led all scorers with 22 points. Pierce and King scored nine points, each, for the Cougars. Clements topped Greensville with 16 points. Teammate Jacqueline Hill hit double-Figures with 10.